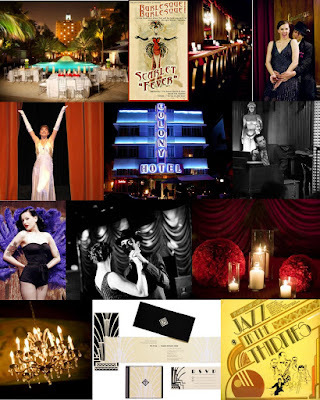 Resources: Art Deco invitations by Gala Design; National Hotel and Colony Hotel located in South Beach Miami; vintage wedding photos by Adi Nevo via Snippet & Ink blog; other images available through google. Great idea - I'm turning thirty in a couple of weeks....and I LOVE the thirties! I may have to think about doing something like this!